Lehenga DetailsColor: Mustard Yellow.Fabric: Thai Silk.Flair Work: Copper Metailc Foil.Length: 42 inch. (42-XL • Stitched)Customized up to Lehenga:&nb..
Lehenga DetailsColor: Orange.Fabric: Thai Silk.Flair Work: Copper Metailc Foil.Length: 42 inch. 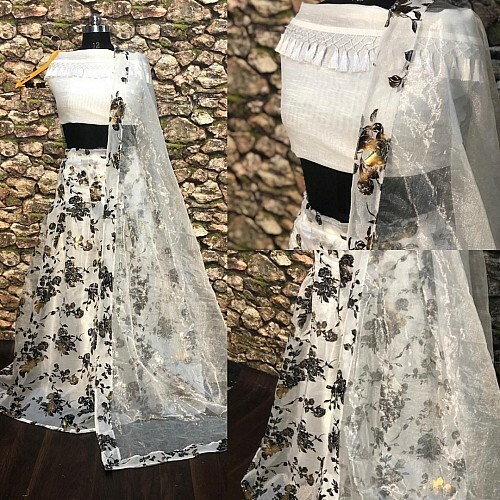 (42-XL • Stitched)Customized up to Lehenga: 40 &..
*# Choli *Fabric : Tapeta silk WORK : embroidery Size : XXLUNSTITCHED CHOLI*# LEHENGHA *Fab..
Choli Fabric : Bagalorey satinWork : PrintedCholi Size &nb..
Duppta Net *# Choli *Febric : Bagalorey WORK : Emarodery Size : XXLUNTICH ..
LEHENGA DETAIL :-FABRIC - ORGENJA SILKINNER - SATTIN SILKWORK - CHINA DIGITAL FOIL PRINTEDTYPE - ..
Choli Fabric : BangaloryWork : EmbroideryCholi Size ..